A Mishawaka family and their pigs are safe and sound after a barn fire broke out Saturday afternoon. It happened in the 14400 block of Madison Road. A family member went to check on their new pigs just after 5 pm and saw smoke in the barn. Four companies responded and the fire was under control in about 30 minutes. The fire was contained inside the 40-foot steel barn and no injuries were reported. 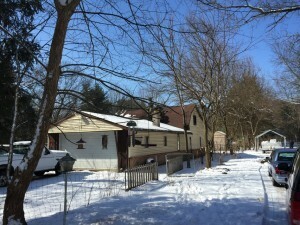 Investigators believe the fire could have started from a heat lamp inside the barn. At 1100hrs on Saturday 2-27-16 the Penn Twp. Fire Department was dispatched to a house fire at 55759 Apple Road between McKinley and Jefferson in Penn Twp. Units arrived on scene to find heavy smoke coming from the attic and requested MABAS Box 13. Penn Squad 13 deployed a 300’ attack line and made an aggressive interior attack on the fire. The fire was held to 2 rooms on the 2nd floor and the attic. 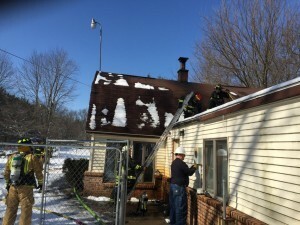 The fire was brought under control in 20 minutes. The cause of the fire is wood in the attic that was up against the chimney and that broke down over time causing ignition. Damage is estimated at $50,000. PTFD was assisted by Clay Fire Territory, Cleveland Twp. FD, SWCFT and Mishawaka Fire. On Friday morning 2-19-16 just before 0800hrs C-Shift Squad 14, Medic 13, Engine 42 and Battalion Chief 5 (Kazmierzak) responded to the US 20 Bypass Westbound between SR 331 and Elm Road for a single vehicle rollover crash. 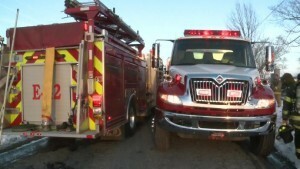 The crash was witnessed and called in by Mishawaka Fire 102 (AC Hunt). Units arrived to find one vehicle that had rolled numerous times back on its wheels. Due to the driver being properly restrained by seatbelts and airbags he sustained only minor injuries and was transported by Medic 13. Here is a photo of the crash and proper blocking by Squad 14 and Engine 42. Space heaters cause one-third of home heating fires and 4 out of 5 home heating fire deaths. Protect your family: if you’re heating your home with a space heater this winter, take a few moments to review these safety tips!